The site of Vietnam’s most extensive Cham remains, My Son (admission 100,000d; 6.30am-4pm) enjoys an enchanting setting in a lush jungle valley, overlooked by Cat’s Tooth Mountain (Hon Quap). The temples are in poor shape – only about 20 structures survive where at least 68 once stood – but the intimate nature of the site, surrounded by gurgling streams, is still enthralling. My Son was once the most important intellectual and religious centre of the kingdom of Champa and may also have served as a burial place for Cham monarchs. It was rediscovered in the late 19th century by the French, who restored parts of the complex, but American bombing later devastated the temples. Today it is a Unesco World Heritage site. The ruins get very busy, so go early or late if you can. 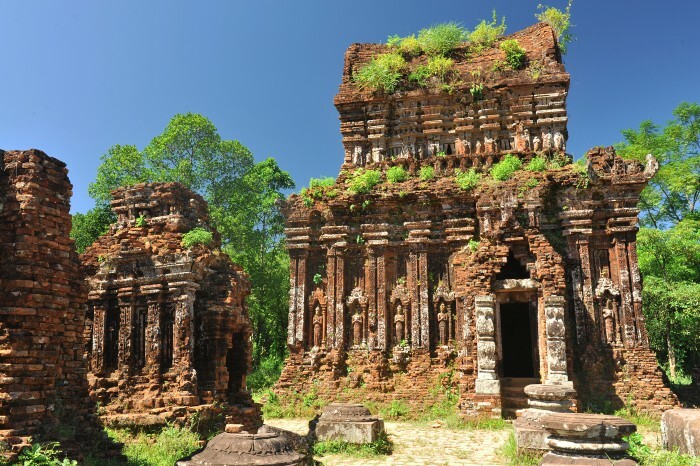 By departing from Hoi An at 5am or 6am, you will arrive to wake up the gods (and the guards) for sunrise and could be leaving just as the tour groups hit the area. Archaeologists have divided My Son’s monuments into 10 main groups, uninspiringly named A, A’, B, C, D, E, F, G, H and K. Each structure within that group is given a number. Note that only a handful of the monuments are properly labelled and there are virtually no information panels on-site. My Son (pronounced ‘me sun’) became a religious centre under King Bhadravarman in the late 4th century and was continuously occupied until the 13th century – the longest period of development of any monument in Southeast Asia. Most of the temples were dedicated to Cham kings associated with divinities, particularly Shiva, who was regarded as the founder and protector of Champa’s dynasties. Because some of the ornamentation work at My Son was never finished, archaeologists know that the Chams first built their structures and only then carved decorations into the brickwork. During one period in their history, the summits of some of the towers were completely covered with a layer of gold. After the area fell into decline, many of the temples were stripped of their glory. The French moved some of the remaining sculptures and artefacts to the Museum of Cham Sculpture in Danang – fortuitously so, because the VC used My Son as a base during the American War and American bombing destroyed many of the most important monuments. The main kalan (sanctuary), B1, was dedicated to Bhadresvara, which is a contraction of the name of King Bhadravarman, who built the first temple at My Son, combined with ‘-esvara’, which means Shiva. The first building on this site was erected in the 4th century, destroyed in the 6th century and rebuilt in the 7th century. Only the 11th- century base, made of large sandstone blocks, remains. The niches in the wall were used to hold lamps (Cham sanctuaries had no windows). The linga inside was discovered during excavations in 1985, 1m below its current position. B5, built in the 10th century, was used for storing sacred books and objects used in ceremonies performed in B1. The boat-shaped roof (the ‘bow’ and ‘stern’ have fallen off) demonstrates the Malay-Polynesian architectural influence. Unlike the sanctuaries, this building has windows and the Cham masonry inside is original. Over the window on the outside wall facing B4 is a brick bas-relief of two elephants under a tree with two birds in it. The ornamentation on the exterior walls of B4 is an excellent example of a Cham decorative style, typical of the 9th century and said to resemble worms. The style is unlike anything found in other Southeast Asian cultures. B3 has an Indian-influenced pyramidal roof typical of Cham towers. Inside B6 is a bath-shaped basin for keeping sacred water that was poured over the linga in B1; this is the only known example of a Cham basin. B2 is a gate. Around the perimeter of Group B are small temples, B7 to B13, dedicated to the gods of the directions of the compass (dikpalaka). Group A was almost completely destroyed by US bombs. According to locals, the massive A1, considered My Son’s most important monument, remained impervious to aerial bombing and was intentionally finished off by a helicopter-borne sapper team. All that remains is a pile of collapsed brick walls. After the destruction of A1, Philippe Stern, an expert on Cham art, wrote a letter of protest to US president Nixon, who ordered US forces to stop damaging Cham monuments. A1 was the only Cham sanctuary with two doors. One faced east, in the direction of the Hindu gods; the other faced west towards Groups B, C and D and the spirits of the ancestor kings reputedly buried there. Inside A1 is a stone altar. Among the ruins, some of the brilliant brickwork (typical 10th-century style) is still visible. At the base of A1 on the side facing A10 (decorated in 9th-century style) is a carving of a small worshipping figure flanked by round columns, with a Javanese sea-monster god (kala-makara) above. The 8th-century C1 was used to worship Shiva, portrayed here in human form. Inside is an altar where a statue of Shiva, now in the Museum of Cham Sculpture in Danang, used to stand. Note the motifs, characteristic of the 8th century, carved into the brickwork of the exterior walls. With the massive bomb crater in front of this group, it’s amazing that anything’s still standing. (incl with entrance ticket; 6.30am-4pm) My Son’s impressive museum contains many statues from the site and information about how the temples were constructed, the carvings and statues and architecture. Cham culture, religion and way of life are also explained. Buildings D1 and D2 were once meditation halls and now house small displays of Cham sculpture. Dating from the 8th century, Group A’ is at present overgrown and inaccessible. Preservation work is ongoing at Group G, where scaffolding and roofs have been erected over the 12th-century temples. Group E was built between the 8th and 11th centuries, while Group F dates from the 8th century; both were badly bombed. If you follow the path towards K, a stand-alone small tower, you can loop back towards the car park. Almost every hotel in Hoi An can arrange a day trip for you to My Son (US$4 to US$8). Most minibuses depart at 8am and return between 1pm and 2pm. If you go for the boat-ride option on the return leg, add an extra hour to the trip. ‘Sunrise’ trips do not mean you’ll see the first ray of morning light hit the temples, but they will get you in early, beating the crowds. My Son is about 55km from Hoi An. A hired car with driver costs around US$45. The site is adequately signposted so it’s easy to find if you’ve got your own wheels.